Welcome to The Game Shelf! 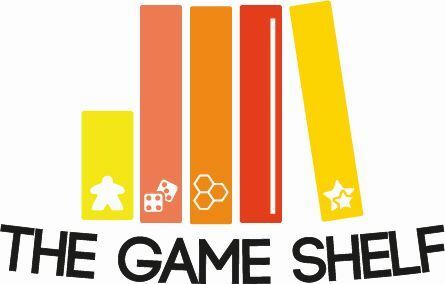 After getting into the board game hobby at the end of 2014, we've decided to share our thoughts on the games we're collecting on our shelves. The collection has certainly expanded over the last few years and we've been making up for lost time! Sometimes our opinions differ, so Amy will be posting reviews every Tuesday and Fi will post on Thursdays. We hope you enjoy reading some of our opinions on board games - especially those for two players. If you've not played Kingdom Rush the video game you are missing out on one of the all-time classic tower defence games. While it might not be one of the first of it's genre it used what had came before to perfect it's addictive, yet challenging gameplay. If you haven't tried it yet the game is available free online, so be sure to give it a go, just be warned it's easy to lose hours of your life! Lucky Duck have once again picked up a video game phenomena and converted it into a faithful board game recreation. Taking theme, style and many gameplay mechanics from the video game and combining it with their design expertise. Just like the digital version you'll be constructing towers to fend off swarms of enemies, upgrading towers to help deal with the upgraded monsters coming your way, and working through an ongoing campaign of increasing difficulty. 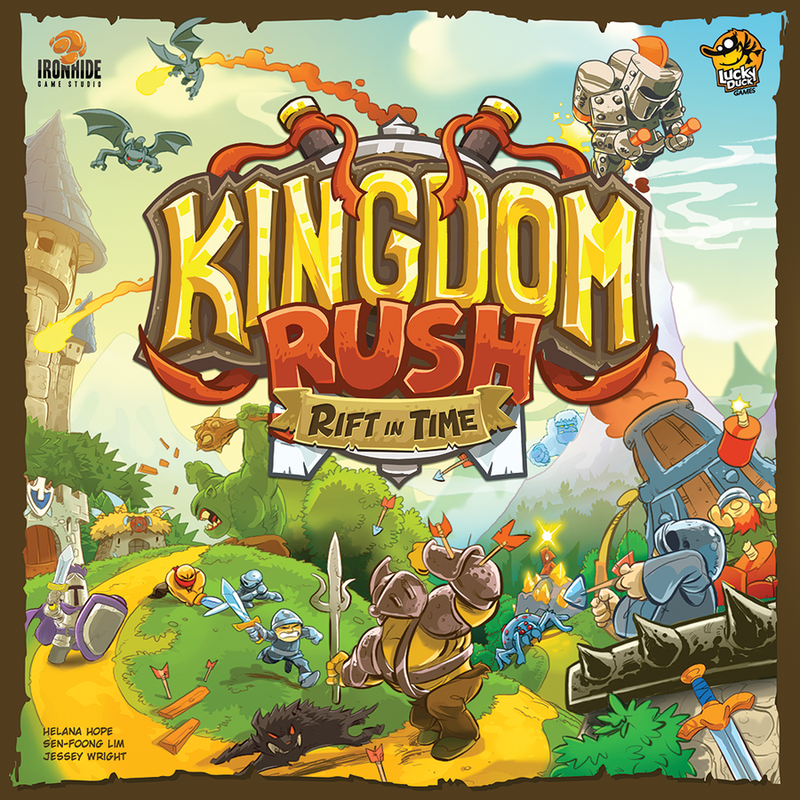 Kingdom Rush: Rift In Time is a cooperative game for 1-4 players. It's coming to Kickstarter on April 9th 2019 and it definitely a campaign to watch! In Kingdom Rush you will cooperatively work together placing towers in order to defeat incoming waves of enemies. Each enemy group comprises of a square grid with monsters on only some of the squares. Playing towers will let you put out tetromino style damage tiles onto a target that is within range. Should you cover all of the monsters on a grid then the swarm of monsters is defeated and you gain some crystals that can be used to buy new towers and upgrade your heroes. The catch is that towers only upgrade if you choose not to use them, passing them on to your neighbour in a powered up variant. As such you must find the right balance between using towers to keep the swarm at bay and upgrading towers to prepare for the more dangerous monsters coming later. Since each player can only place towers on certain spots you also need to make sure the right person has the right tower at the right time. As you continue through the campaign missions get harder with more spawn areas appearing and as such more monsters attacking at any one time. To counter this each player gets a hero. Heroes can roam around the map attacking monsters just like a tower would, but they can also simply stand on a monster tray to help cover up monsters. This does hurt your hero, but you can always take a turn not attacking to recover. There are 4 heroes each with different strengths, heroes can also be upgraded to unlock new abilities like the ranger's battle cat, though these abilities have to be recharged. Most monster trays simply move one space forward every round, assuming you haven't used the guard tower or a hero to stop them in their tracks. But things soon get more difficult, special abilities may give monsters immunity to certain tower types, allow them to quickly kill heroes or have fast movement. Whenever you face special monsters the rule stops apply should you cover up all the monsters that have that power, even if the tray is still alive. Kill the 4 fast wolves and the remaining creatures slow down to regular pace. Should you ever fail to defeat a monster tray before it reaches the end of the board then you will take 1 damage for each uncovered monster, so letting a crippled tray escape isn't the worst thing in the world, but with only 7 health you can't be too reckless! In order to win the game you will need to defeat specific portal cards, these tend to be harder than normal monster swarms, but also are usually immune to towers that haven't been upgraded enough. Even worse they damage heroes that attack them and you permanently lose any tower that hits them! Kingdom Rush is a cooperative puzzle game in essence, and a very good one at that. Deciding as a group when is the best time to use towers and when is best to upgrade them is tricky enough by itself, but add in the special monster abilities and heroes and soon the puzzle gets immensely complicated. While the puzzle itself is complicated the gameplay isn't. Each turn you either play towers or pass them, use your hero and once everyone's done check for defeated trays. Trays then move and new ones appear until you have destroyed all the portal cards or been defeated. It's inherently approachable, though you may have to step in to stop new players from rotating the damage tiles, that's a perk that only high level towers offer you! The preview copy we received featured 3 missions, and quite the difficulty curve, mission 3, I rather suspect, may not be mission 3 in the full game. But rather was a taster of things to come since we were thoroughly thrashed by it! However each featured a new twist on the gameplay with new monster types making regular appearances to prevent you from getting too comfortable with a strategy. Learning when best to use each tower is vital too, they all have their own flair such as the cannons that hit multiple targets when upgraded and the archers who can attack from a longer range giving you more placement flexibility. 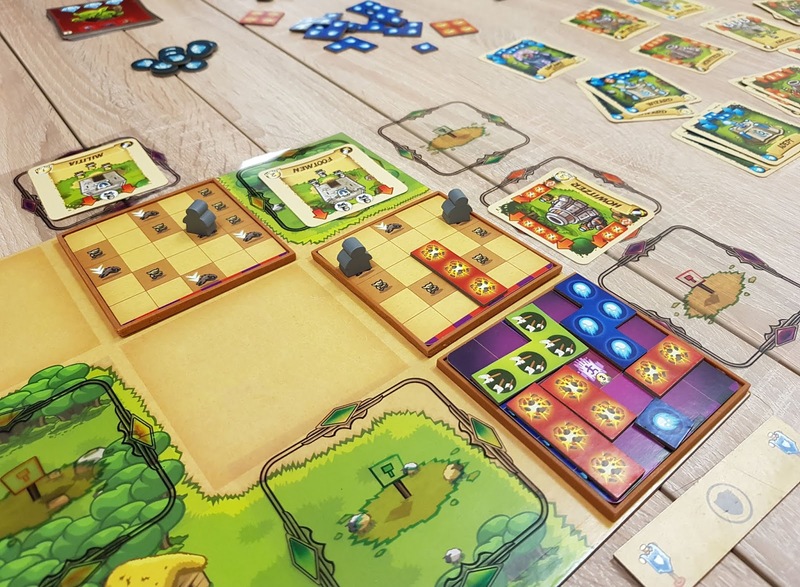 Combine all this with Lucky Duck's usual faithful interpretation of the source material and fantastic art style and you have a wonderful, and very different cooperative game. Unlike many tower defence games it's not just about putting damage on the attacking forces. But attacking them cleverly, using the right thing from the right angle to cut off their special powers, slow them down and destroy them. Since you have a personal hand of towers and a personal hero it's hard, though not impossible, for an alpha gamer to take control of the game. Kingdom Rush is certainly worth looking into when it comes to Kickstarter. Kingdom Rush is puzzly kind of cooperative game that really satisfies my brain. It's amazing to me how far the 'tetromino' phase in board gaming can be stretched. It's fun to try and tesselate the pieces to eliminate the enemies on each tile and feels like a totally new take compared to the myriad of tetromino tile-laying games on the market. I love how the cooperation in this game is about figuring out how you can collectively do the most optimal job of eliminating enemies. We've had the chance to play a few different scenarios so far and we've loved the different levels of difficulty and complexity we've experienced. The game has great introductory scenarios, and then the introduction of the heroes makes each character assymetric and powerful and vulnerable in their own special way. The final scenario we played was super challenging and really highlighted the fun decision of whether to upgrade your tower cards early to become more powerful or to start trying to chip away at the enemies straight away. We haven't won the game yet on it's hardest setting, but we're still working on it! One of the games that Kingdom Rush most reminds me of is Magic Maze. As a cooperative game that ramps up in difficulty with each scenario and replies heavily on the coordination of each player's choices, I see it appealing to similar gamers and grabbing a broader audience due to having no real time elements and open communication. Kingdom Rush is likely to appeal to both gamers and families with suitable difficulty options for any kind of group and I highly recommend checking this one out. The game gives you the simple, but tough, choice between attacking now or upgrading for bigger attacks later. The super colourful graphic design, miniatures and transparent tile overlays really make Kingdom Rush an eye-catching experience. Every player is given a purpose and has a time to shine at different moments as the enemies advance through different zones of the board. The difficulty ramps up very quickly, but we hope that there will be many more scenarios of varying difficulty in the full game. As a cooperative game, the alpha player issue is not mitigated, although this shouldn't be an issue unless you're unlucky with your group. Kingdom Rush: Rift in Time is both super faithful to its source material as well as being a superbly implemented cooperative game. For us, it's the best project coming from Lucky Duck Games since Chronicles of Crime. 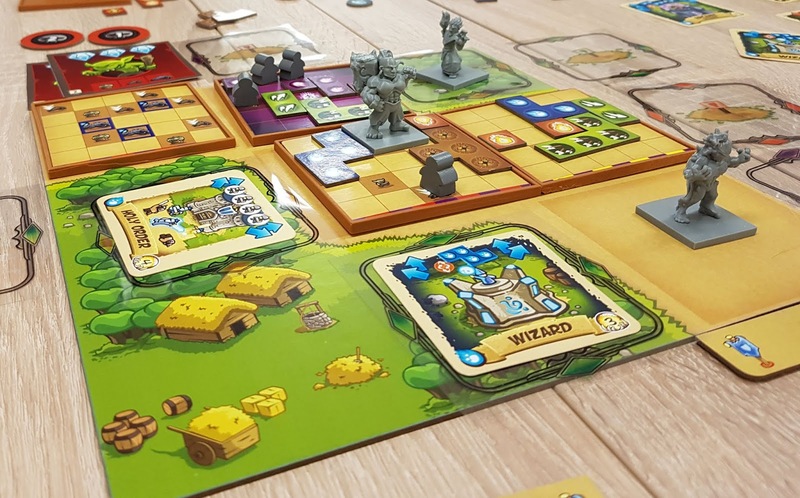 If you are looking for a new lighter weight puzzly cooperative game then definitely check out Kingdom Rush on Kickstarter! 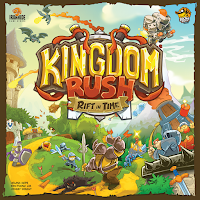 Kingdom Rush: Rift in Time was a prototype kindly provided to us by Lucky Duck Games. It launches on Kickstater on April 9th 2019.